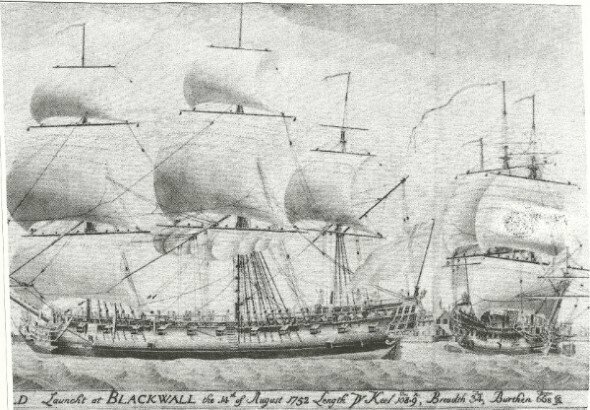 The Falmouth was commenced by Mr. Perry to Blackwall Yard (England) on the 22nd of August 1750 and launched on 14th August 1752 as show on page 27 of "Chronicles of Blackwall Yard" by Henry Green and Robert Wigram . It was the first trading vessel of the English Indiaman Companies and showed a close resemblance to a warship in sail plan and rigging, with the most up-to-date reef-points to her topsails The ship was equipped with a large amount of artillery, unusual for the trading vessels of that period. 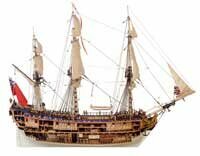 In that she was run along the lines of naval discipline was due to the fact that the vessel could sail alone without any convoy ship, since its rich load was a good bounty for all the enemy vessels and pirate ships. The Falmouth could easily combat a war-ship of the same tonnage, thanks to its crew of 180 experienced men including the best trained gunners. The superiority of the crew was partly due to the incentive granted to each gunman allowing each individual to transport his own 5 tonnage of goods there and 2 tonnage back. These goods were usually sold as smuggled goods to the black market. The Falmouth was of 499 tons and was in service until 1764 completing five voyages for the East India Company under the Captain George Hepburn. She was lost on her sixth voyage, wrecked at Sogar Bank in 1766. 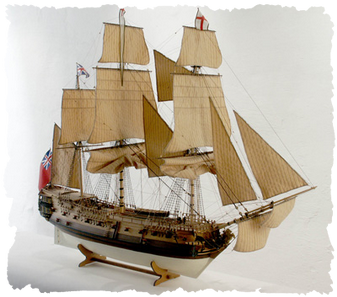 The following photos are an example of how a finished model of the Falmouth can look.